I love clementine season! I buy a crate every week, but sometimes we don’t get to eat them all. One day I had a lot of clementines that needed to be used, so I invented this salad. Lime and cumin offset the sweetness of the clementines. There’s chipotle for smokiness, jicama for crunch, and mint for extra zing. 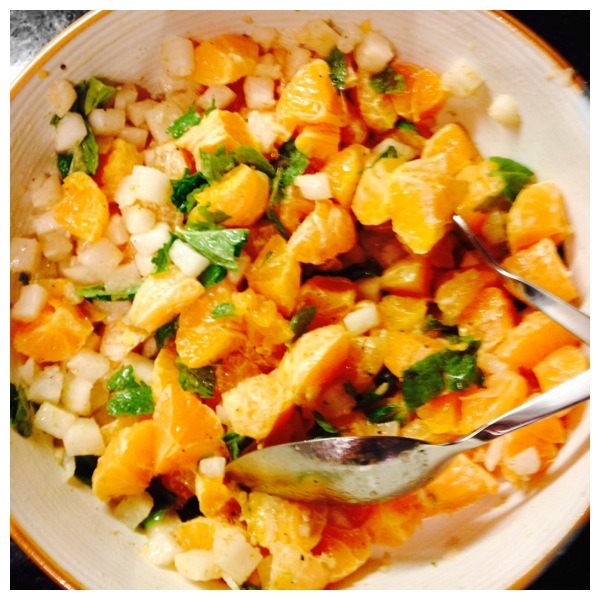 Place clementines and jicama in a large salad bowl. Combine dressing ingredients in a jar with a tightly-fitting lid (like an old jelly jar) and shake until well blended. Taste the dressing for seasoning, adjust if needed. Drizzle dressing over salad and toss until combined. Top with mint leaves, give it one more toss, and enjoy! Don’t have this many extra clementines lying around? Use fewer clementines and add some spinach or mixed baby greens. Can’t find jicama? Use coarsely chopped cucumbers instead (peeled and seeded, unless using baby cucumbers). This is an original radish*rose recipe. All images & content are copyright protected. Please do not use my images without prior permission. If you want to republish this recipe, please credit radish*rose or simply link back to this post for the recipe. Thank you.